Ready to easily create Sankey diagrams? Visualize the process with SANKEY Diagrams! SANKEY diagrams and SDraw help you visualize, document, and share perspectives with attention-grabbing flowcharts. 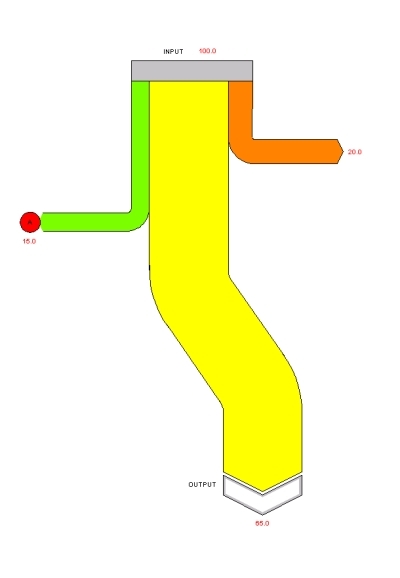 Sankey diagrams are widely used in technology where material and energy balances have to be visualised - the flow rates and quantitative relations of a process can be visually created and depicted. The end result is thorough understanding of all the process steps and their interrelationship. 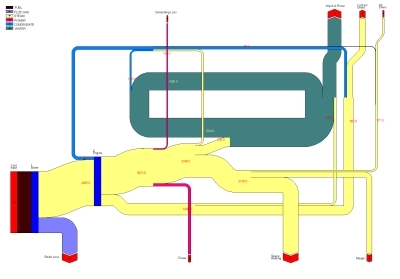 Sankey diagrams have proven to be an outstanding tool in environmental technology projects for analysing material and energy related problems. The next logical step is the visualisation of monetary values (e.g. money flows) by the means of Sankey diagrams. You don't need to be an artist to create compelling drawings and diagrams. 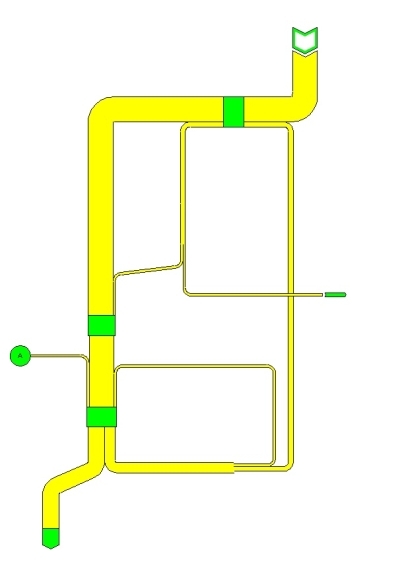 SDraw gives everybody be it an engineers or an environmental professional the most comprehensive technical diagramming and drawing tool available to create and share information about process flows with ease. Place your nodes and streams across the drawing surface add "components" and flow values to the streams and you are done. It's just as easy as 1-2-3. Unlike clip art, SDraw's objects behave like the real-world objects they represent. Text stays with their object; streams stretch and change their routing when you move nodes around. No matter what dimensions your flows are in - you can even assign conversion values between different measures! - SDraw has the potential to show them according to their importance. You need less detailed previews? Just combine nodes to a single node to clarify and tidy-up the layout of the process. The familiar windows interface will help you to create great-looking Sankey diagrams in no time. You have changing data in your process? No pain! Visualize the data you work with every day — use SDraw to automatically update your Sankey diagram from existing information via the use of interface files (csv, dbf - taylored solutions are available). Or, store your data in files -then use it to generate reports, or export it for analysis into other programs. Data stored in S.Draw diagrams is easily exported to Microsoft Excel, Microsoft Access and other reporting and data-analysis tools. During the last years we conducted a survey on S.Draw users (based on direct customer interaction and feedback) focusing on the benefits of using S.Draw for drawing Sankey diagrams versus using other software packages. When using S.Draw to understand complex processes, systems, distributions, or ideas, S.Draw provides users and audience with remarkable improved clarity. When using S.Draw as a strategic, conceptual, or resource-planning solution, users are genereally more effective, and take less time to achieve possible solutions. Our versions for universities and schools that come as Network, SU FLEX and SU C1 versions. Please check the shop or inquire if you need more information. The network version uilizes a license server (PC) that holds the USB dongle (copy protection device) on your TCP IP network. Very flexible – you do not need a copy protection device if you are attached to the network. Standard is a 5 user license (concurrent users!) but this can easily be extended to whatever your needs are. This version of SDraw is software activated and does not need a copy protection device. You will be able to download the sotware and activate it via email. While this version is cheaper, it can be installed on a SINGLE CPU/PC only and is NOT TRANSFERABLE to another computer. This version utilizes an USB dongle and can be installed on and run on all of your computers. The dongle represents your license. Our most flexible and versatile version! During my time working for an environemtal consulting company (around 1995) I developed SDraw together with colleges and coworkers. Simply out of the need to visualize processes in an easy grab able and understandable way - namely Sankey diagrams. After more than 20 years we continue to develop SDraw and attach it to the current available operating systems. YES, we run on Microsoft's Windows 10! We value your input - please contact us per email with questions and suggestions.